More than fifty Compton Unified School District students are seeing the world more clearly today thanks to a new partnership between the school district and the nationwide nonprofit Vision To Learn. On Friday, November 14, Vision to Learn (VTL) provided new eyeglasses for the Clinton Elementary and Dominguez High School students at an event on the Dominguez campus. The partnership is one of many CUSD has developed to support student academic success. The new glasses were created by Vision to Learn staff after a visit by VTL’s mobile eye clinic and careful examinations of all the eligible students. Established by the Beutner Family Foundation in 2012, Vision To Learn provides free mobile eye exams and free eyeglasses nationally. The Foundation has provided more than 20,000 students with free eyeglasses. 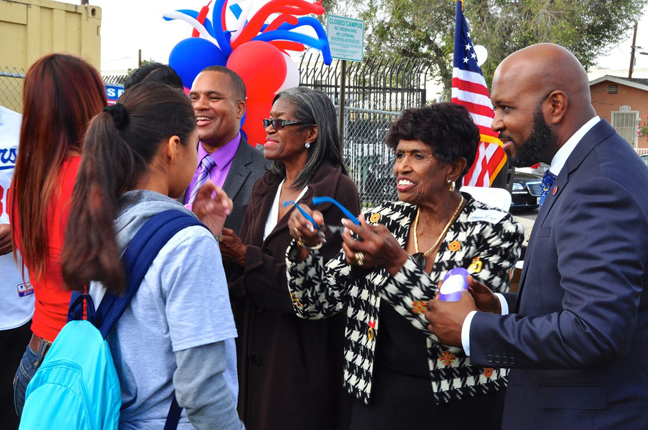 “Glasses, student health - all of that assists with driving student success, with driving up academic test scores, and with making certain that our children not only are academically sound but also healthy and safe,” said Micah Ali, Compton School Board President. For Clinton Elementary Principal Kanika White, Ed.D. it is clear her students’ new eyewear will help them focus in more ways than one. “We at Clinton Elementary School understand that it takes much more than classroom time to help our students succeed. We also need to make sure students are healthy because we know healthy students perform better,” said Dr. White. Several influential Compton community leaders came out to support the project including LA County Supervisor Mark Ridley-Thomas (2nd District); Vision To Learn’s Founder Austin Beutner; Michael D. Smith, Office of Cabinet Affairs at the White House; and Compton Mayor Aja Brown. Once Dominguez 11th-grader Luis Desiderio put on his new glasses, he instantly saw a difference in his eyesight. “Everything I see is full of color and a lot more clear,” he noted. “It’s my first time getting glasses.